This Catit Magic Blue air purifier is 25 times more effective than an activated carbon filter and is free from all chemicals, as well as being easy to use. It offers improved air quality in enclosed litter trays as well as in the surrounding environment and is entirely natural. The small filter pads are in cartridges that your cat cannot acceΒ and can be easily attached to the top of the litter tray. The pads absorb the unpleasant odours like a sponge, rather than merely trying to mask the smell as chemical air fresheners do. This purifier can help remove up to 80% of ammonia gas, which is particularly pungent and can cause adverse reactions in cats, other pets and children. Stool odour is also reduced by an average of 40%, depending on your cat's eating habits. Catit Magic Blue is the ideal alternative to toxic chemical air cleaners. It fits in every litter try and keeps your home fresh and hygienic! Catit Magic Blue at a glance: Air purifier for enclosed litter trays Efficient and natural: free from chemicals and completely non-toxic, as well as 25 times more effective than activated carbon filters High absorption rate: absorbs unpleasant odours rather than merely masking them Up to 80% leΒ ammonia gas: particularly effective against unwanted ammonia gas, which can be harmful to the health of pets and small children Absorbs approx. 40% of stool and urine odour: significantly fewer excrement smells, depending on your cat's diet Easy-to-use: replaceable filter pads in cartridges are slotted into the docking station which is attached to the top of the litter box interior Fits every litter tray: handy format Clever alternative to toxic or chemical air purifiers Please note: The Starterset (variant number 583578. 0) comes in the blue packaging and contains the air purifier and 2 Catit Magic Blue filter pads, which provide fresh air for up to 1 month. 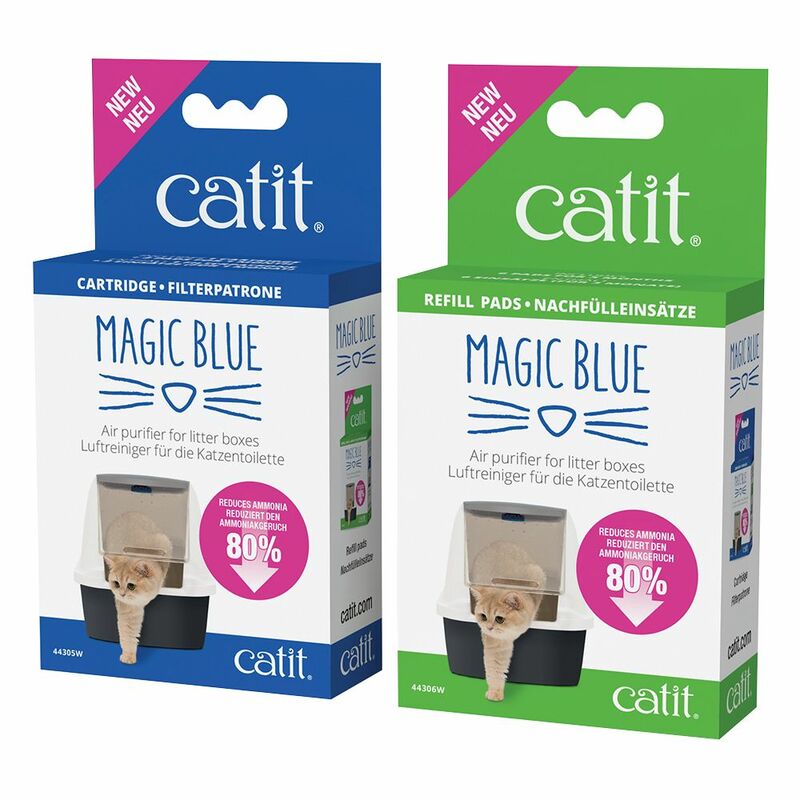 The Refill Pack (variant number 583578.1) comes in the green packaging and contains 6 Catit Magic Blue filter pads, which will provide fresh air for up to 3 months.